Are you tired of poor software that is bundled with modems? Do you want to explore all the possibilities of our wonderful communication world? Then choose a modem bundled with BVRP Winphone 2000. A French corporation, named BVRP, makes this integrated software. BVRP has concluded many strategic alliances with modem manufacturers such as 3com, Diamond, Eicon, Lucent, and a European leader in communication software. Winphone 2000 can now be bought directly from BVRP.com as a downloadable software in more than 13 different languages. Thanks to BVRP to make this software available to everyone! Winphone 2000 has been greatly improved, comparing it to previous releases. It now comes with a brand new customizable GUI and supports a wide range of modems from ISDN to GSM! Connect your modem, insert the Winphone 2000 CD, and choose your language! Then the setup will run. In less than 5 minutes Winphone 2000 will be installed on your computer. Reboot the computer and launch Winphone 2000 by double-clicking its desktop icon. Double-click your desktop Winphone icon (what a pity to see that the icon isn’t very nice) During this first run you’ll have to choose your favorite modem (if you’ve got numerous modems) and Winphone will configure it to work properly with it. Now you’re ready to use all the features this software includes: fax, email, terminal, cordless phone, answer phone, file transfer, minitel and much more! Winphone 2000 is now customizable! That is to say that you can change the skin of the software to fit your mood! Here we very appreciated this feature! Winphone 2000 can use an Outlook like GUI, a phone like GUI, a palm like GUI and much more! Depending on what your modem manufacturer included you’ll have more than 7 predefined skins. Winphone 2000 will work with almost any modems, thanks to its TAPI32 compliant stack! 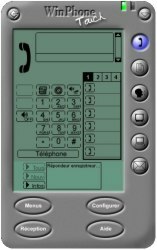 Hopefully, Winphone 2000 perfectly supports independent modems that can store your messages/faxes even if the computer is off! Winphone 2000 now supports ISDN modems due to its CAPI 2 support. However all the ISDN modems that use their own CAPI modified protocol won’t work correctly. Our test modem, (Bewan USBooster 128) uses a softly changed CAPI 2 protocol isn’t managed correctly by Winphone 2000. But BVRP & Bewan are working closer to fix this issue. Winphone 2000 also supports all related cellular phones that use the following protocols: GSM, DCS and CDMA. Winphone 2000 is great fax software. You can send faxes from any software that support the print feature ! Simply print to the BVRP printer and click OK. A wizard will appear asking you to type the fax number and the name of the contact (you can even store all this information in an address book), then it’ll offer you to include or not a cover page. Once you’ve answered to the wizard you can preview the fax and send it (you may also add other files such as pictures). Faxes we sent were very clear and when we sent faxes with pictures the pictures looked great on the output fax machine. Depending of the skin you chose during the fax sending you’ll see a fax progression real-time animation that will show your fax sending status line by line! You can also receive faxes by simply launching the software. It’ll answer to all incoming calls. As it supports smart modems, Winphone 2k will allow you to retrieve faxes from modems that store faxes even if the computer is off. Winphone will indicate users if they’ve got new faxes with a warning message box. An interesting feature allows users to convert faxes in TIFF files or GIF files. If you’ve got a voice capable modem with a speaker, you’ll enjoy with Winphone the pleasures of speaking to someone without holding the phone, thanks to the cordless mode. In the phone mode, Winphone will show a dial pad where you can dial numbers and store them in a fast dialing list or in the address book. During phone calls you can set the volume of the speaker and of the microphone. You can also answer in cordless mode to all incoming calls. Winphone 2000 is also an answer phone (even if you haven’t got a smart modem). For users that have smart modems, Winphone 2000 will automatically retrieve voice messages and store and play them. It also allows users to change the answer phone welcome message and the answer phone mode: (record / answer only). If users haven’t got a self-memory modem, they’ll be able to create an answer phone that work only if the computer and Winphone are running. Winphone will record a welcome message and will answer all your incoming calls and store the message directly on the hard disk. Users will be able to sort, manage and listen this voice messages! More they’ll be able to save the voice messages on their hard disk. As Winphone is smart it’ll automatically detect the difference between a fax and a phone call and retrieve both of them like a great boy, so you won’t have anymore related faxes headaches! Here is the Winphone’s weakness: its email manager is really obsolete. It doesn’t support HTML messages, you can have just one email account, and we’ll stop here the list of all the Winphone 2000 email manager’s deficiencies. Even if it works correctly and supports POP3 the email manager hasn’t got any interest since every Windows users have got Outlook Express that is really better. French users used a ‘thing’ called minitel. Here in France it’s the ancestor of the Internet. Even with the high spread of internet a lot of French users still use the old good minitel to order things, view their bank accounts, find a phone number, etc. Winphone 2000 supports the Minitel by providing all the basic needed features. Every viewed page can be printed and recorded on the hard disk. 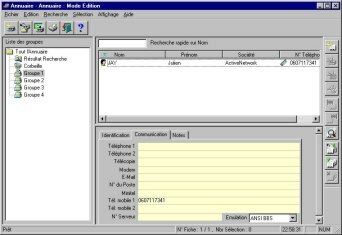 All services can be logged in a minitel service book that will directly call and log the user onto the service. BVRP has thought to all the users that need to regularly connect themselves on BBS, on remote systems, by integrating in Winphone 2000 a terminal module. In fact it does the same job than the Hyper Terminal Microsoft windows’ applet. Winphone 2000 comes with a complete address book. You can store in it all your contact information such as names, company, phone & fax numbers. You can sort your contacts in different groups using drag & drop (we regret the fact that you can’t rename the groups). Due to the search feature you’ll be able to locate the lost contact in a few clicks. Import and export features will help you recover or share your contact database. The print feature will allow you to print each contact’s sheet. However even if the address book is complete its GUI isn’t very clear and the import/export features will scary every users even expert ones!